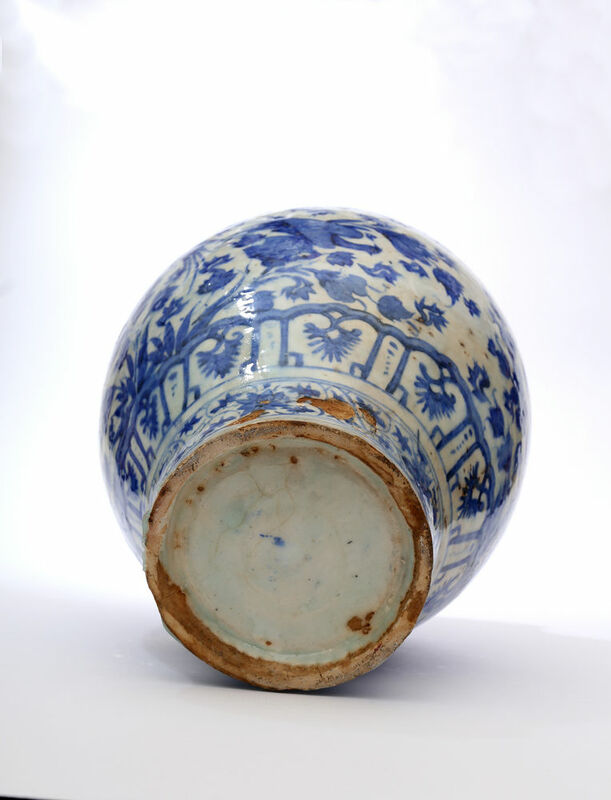 This courtly Safavid fritware vessel closely resembles contemporary blue and white porcelain made in China, yet further inspection reveals the ingenious creativity of the Iranian potter. 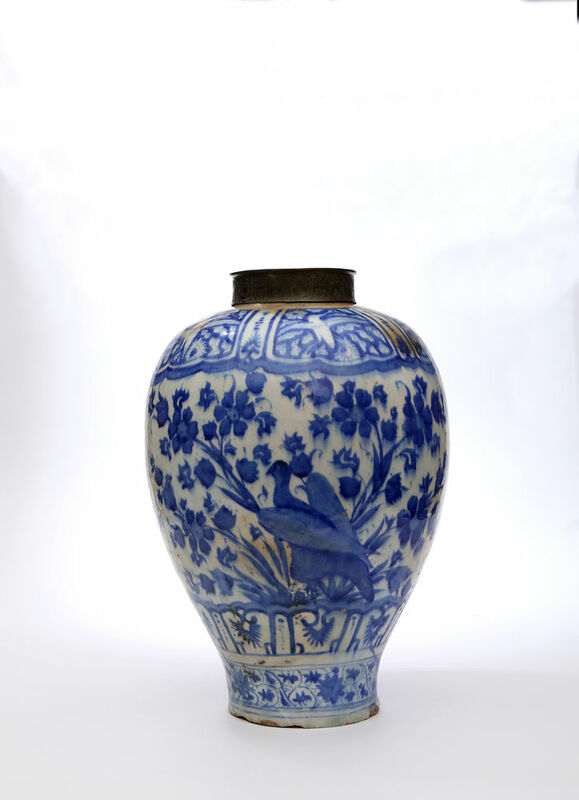 The decorative scheme, executed under the glaze in native cobalt blue, is divided into four zones. Around the shoulders are five Ming Kraak-style panels with flying cranes in reserve. The body has two large scenes: the front has two confronting simurgh, or phoenix, regally perched on blossoming lotus branches above two additional mythical birds about to take flight, while the reverse has a large hawk resting on similar flowers and foliage. The base has a classic chinoiserie band of petal panels with inverted blossoms above a leaf-curl diaper band set within double lines. The harmoniously balanced primary composition appears to be unique. 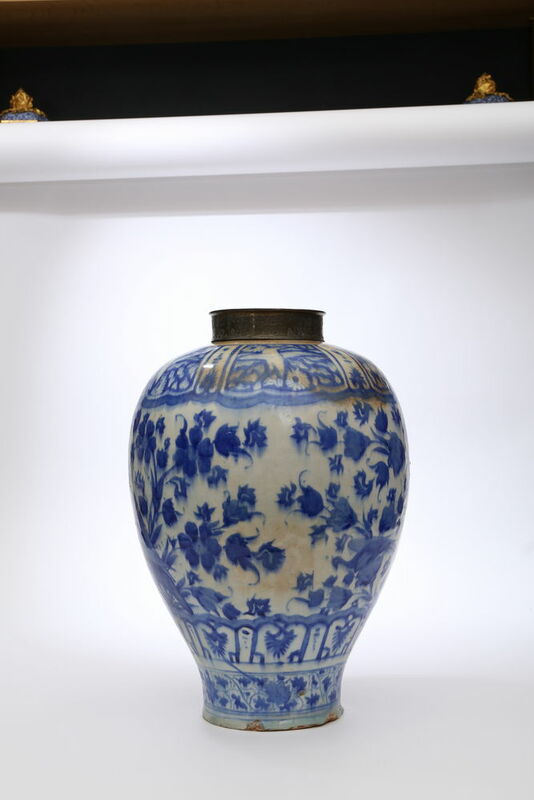 Jars of this large scale and shape with its broad shoulders and gently waisted tapering base are rare; only one slightly earlier example is in the documentary collection of the Victoria and Albert Museum, London, ht. 52.5 cm, acc. no. 692-1902.3 Storage jars surviving with their original covers are non-existent, and this vessel may have been an open vase with a taller slightly flaring neck. The reduced neck has been mounted in brass and engraved with contorted human and mythical figures, possibly acrobats or wrestlers, each embedded within tight scrollwork. It was probably added in Iran, perhaps Isfahan or Tehran, Circa 1850-80. Similarly mounted Safavid vessels in the V&A, acquired in the 1870s and 1880s, are also decorated with dense miniature schemes including comic monsters, demons and animals. 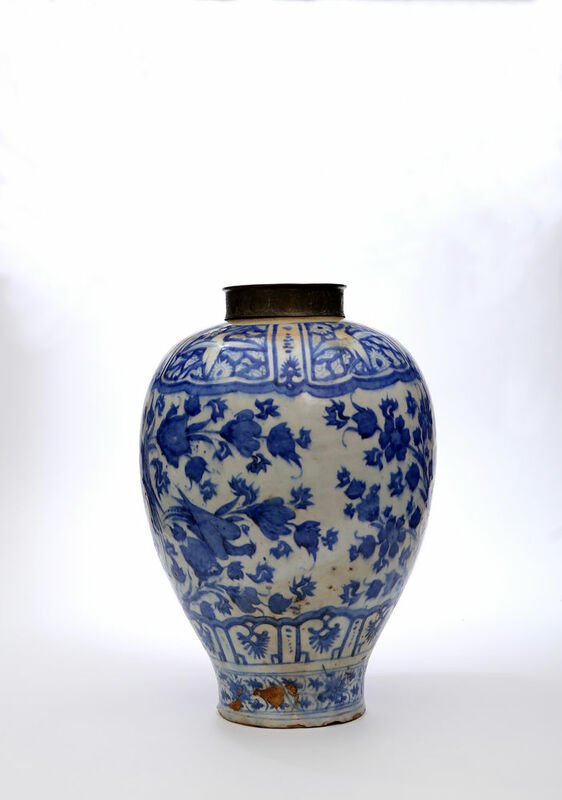 The metal collar provides evidence that in Qajar Iran even damaged this vase had currency as revered domestic property. Safavid ceramics were appreciated as heirlooms and often repaired for preservation or for use; a tradition of metal repairs goes back to the Safavid period and possibly earlier.4 During the period of instability in the Qajar period, in the absence of gold and high-value coinage, historic ceramics, both Chinese and Iranian, had a commercial value, acting as cashable assets and were in regular circulation through the profession of china-sellers (chini-foroush), who acted as agents (dallal) offering private credit to the nobility and others, as pawnbrokers. The mounts not only physically secured their investments, but they also enhanced the aesthetic appreciation. Condition – Neck probably reduced, restoration to 1.5 cm hole at side. Literature – 1. Lisa Golombek et al., Persian Pottery in the First Global Age, The Sixteenth and Seventeenth Centuries, Leiden, 2014, pp.98–100. 2. Golembek 2014, fig. 2.68. 3. 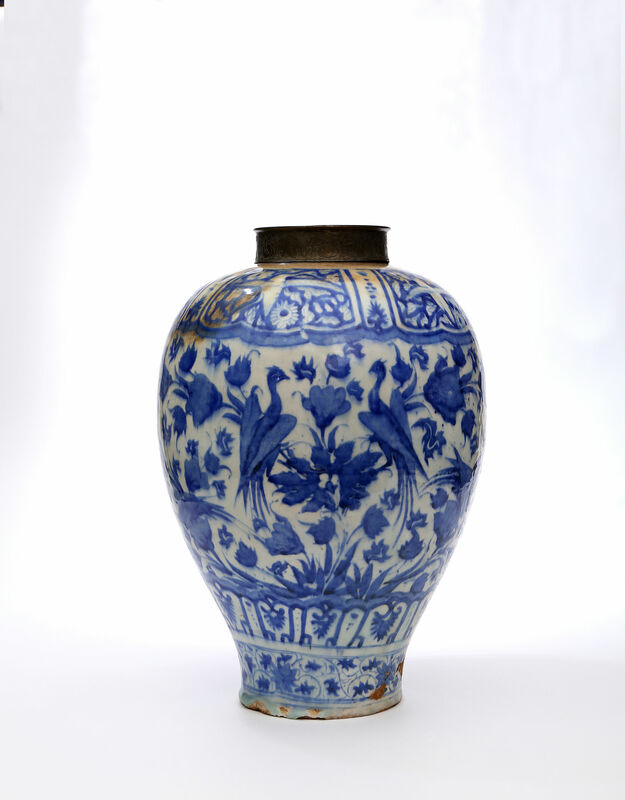 Yolande Crowe, Persia and China: Safavid Blue and White Ceramics in the Victoria and Albert Museum 1501-1738, Switzerland/London, 2002, p. 156, cat. no. 248. 4. Moya Carey, Persian Art: Collecting the Arts of Iran in the 19th Century, London, 2017, pp. 93–6, pls. 86 and 87.